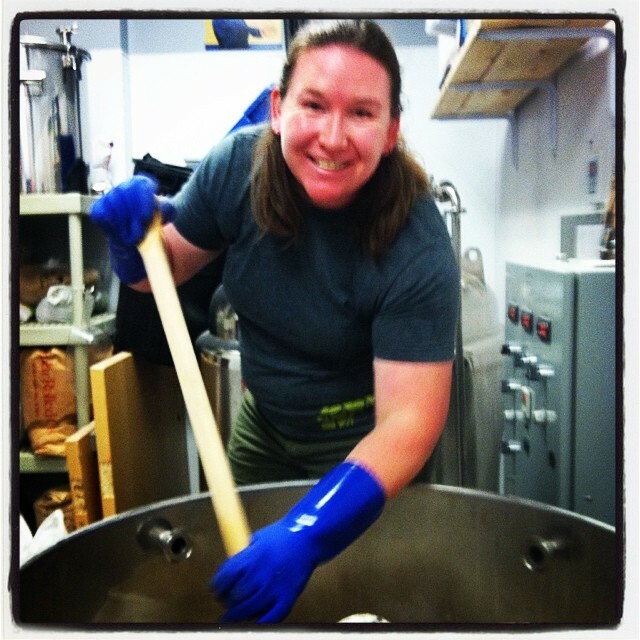 My name is Kim and I wanted to share my brewing journey with you so you might be inspired to start your brewing career, too! (If this is something you are interested in trying, the work is arduous, but very rewarding.) My journey is a-typical, I hear, but this statement holds little weight with me. I just want to brew beer! (Above) I’m mashing in my first 300 pound mega-mash for Barrels and Bottles Brewery, in Golden, CO, in the summer of 2014. Celebrating my tenth month brewing in Golden, I have been reflecting on my brewing career and thought that I would share a bit about my two years of professional brewing in Colorado. The path that lead me to Barrels and Bottles Brewery was both extremely uncommon for the beer industry and yet, common among head brewers. 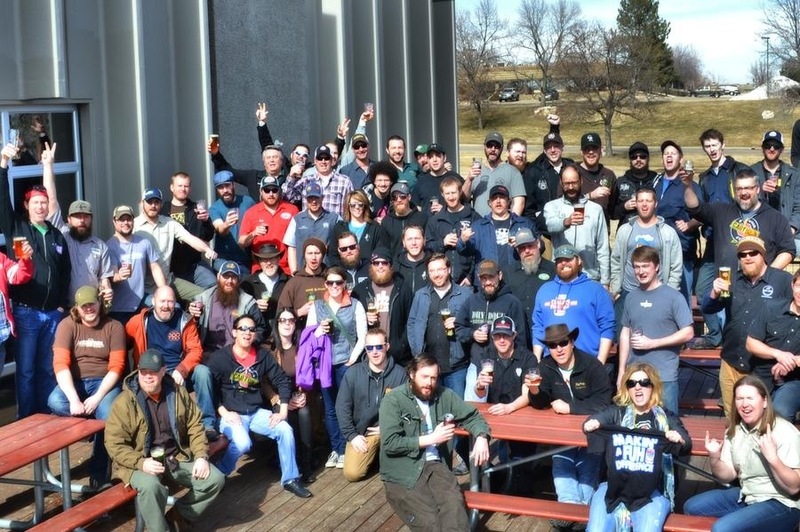 The motley crew, photographed above at Oskar Blues “Tasty Weasel” Brewery, collaborated to make a beer for the 2014 Craft Brewers Conference in Denver. They are a large part of my beer family. I have been so fortunate to meet the people and visit the brewing places they own over the past year and a half. (Note: I met the brewing community by traveling to their breweries and swapping beer and stories. I suggest putting the time into meeting the brewers in your locale. It’s always worth it.) I’ve always felt welcome in this community, even when I began as an apprentice at Tommyknocker Brewing. I credit the beginning of my brewing career dually to the MBAA (Master Brewer’s Association of the Americas) and to Tommyknocker Brewing. I attended the MBAA Malting and Brewing Course in 2012 and learned enough to split my brain open, ultimately making me a well-educated almost- pro brewer. It pushed the limits of my understanding of the brewing process, from beginning to end, and I’m STILL digesting it today. When I arrived home to Colorado after my course, the brewing crew of Tommyknocker Brewing welcomed me into their brewery at 5am in the morning for three months to learn to brew on their 15 barrel system. During my three months as a brewer’s apprentice, I brewed many different recipes and acquired safety glasses, a flashlight, and my very own pair of bright green Blichmann gloves. I climbed into the mash tun, gave spent grain to a local farmer with cute baby goats, and learned how to properly scrub brewery tanks and floors. It was an important and challenging experience that I’ll never forget. 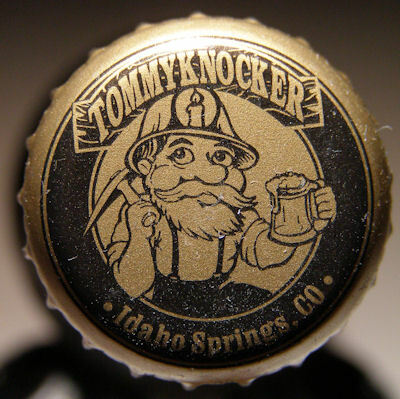 After those foundational months, I began part-time employment at Tommyknocker. During this time, I stacked grain, learned to carbonate and keg beer, run a keg cleaner, and continued forming important brewery relationships that would help me in the future. Shortly thereafter, I was offered the opportunity to become a full-time brewer for Boulder Beer, in Boulder, CO.
At Boulder, I learned to run a brewery cellar from two of the three owners of Sanitas Brewing (Boulder, CO). They taught me how to properly run a cellar and troubleshoot many common problems. I still use these skills today. However, I only spent five months at Boulder Beer due to the painfully long commute and difference in career needs. Thankfully, I formed a couple solid friendships that lasted through me leaving Boulder and heading to Epic Brewing Denver. I spent eight months brewing beer for Epic Brewing Denver. I formed lasting new friendships and worked harder than I imagined I could. I brewed at 4:00AM and deep into the night and felt like an important part of a team with both the front of the house (bar staff) and back of the house (brewers, cellarmen, packaging, warehouse). I was grateful for high quality in-house brewing, barreling, and cellaring training, the opportunity to make mistakes and learn from them, as well as out of house professional development. This job was the most skill heavy position I have had in the brewing industry. When I wasn’t brewing or cleaning, I was helping in any area and any way I could. Epic Brewing ran like a machine, even when we lost an employee and gained a new one. I will never forget how important Epic’s staff and opportunities were to me becoming a Head Brewer. It seems that the workplace list served me well thus far and that the obvious theme of the list is OPPORTUNITY. There are so many ways to brew a beer, beer styles to choose from, different training, collaborations and other things that make brewers great. All I want is a shot to try it all. Although it may sound like too much to ask, I think I’m worth it. Back to the current chapter of my brewing journey…. 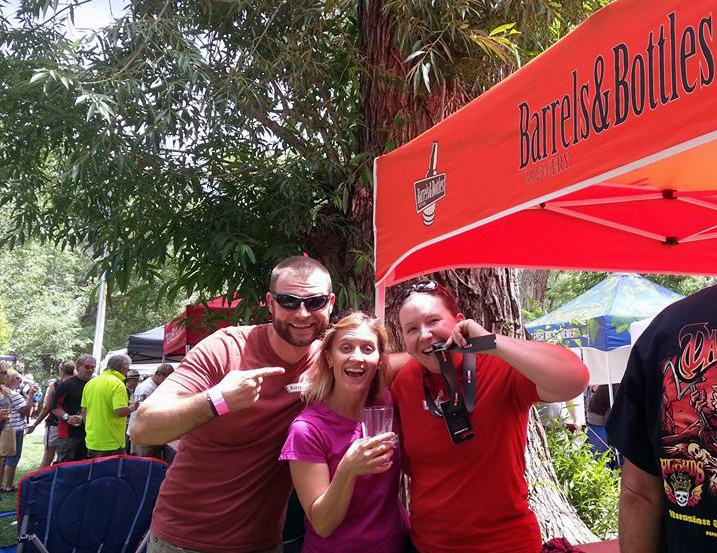 I was offered the Head Brewer position at Barrels and Bottles Brewery, in Golden, CO, in April 2014. My job is to DO IT ALL! I get to create all beer recipes, brew the beer, run the beer cellar (cleaning, dry hopping, fruiting, etc. ), research and purchase ingredients and equipment, and represent Barrels at festivals and events. To say the least, I am ecstatic to finally be pulling all of my skills sets together to make unique beer. This photo of Abby George (co-owner of Barrels and Bottles) and I is from the first beer I brewed, a collaboration with the previous brewer. 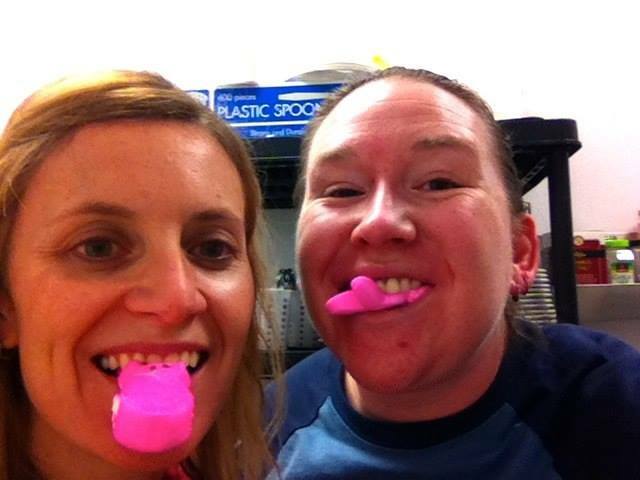 The beer was named “Hoppy Peeps” and was an ESB with Peeps added to the boil. Within the right work environment, brewing can not only be fun and challenging, but sustainable work. Hire the people that fit into your business and make sure they are appreciated. As I approached GABF (Great American Beer Festival) this year as a Head Brewer, I was not only excited and slightly nervous, but extremely humbled. In less than two years, I achieved more than I imagined. This photo of Abby, Zach (other co-owner) and I took place in Salida, CO at the 18th Annual Brewer’s Rendezvous, where we brought home the “Brewer’s Belt.” This years competition was to brew a beer that was white, yellow, or blue, and 3.8% ABV due to Colorado state colors and being the 38th state. We won with our “Go Wit It” Extra Wit, brewed with traditional spices, citrus juice and zest, golden melon, and mangoes. My current brewing chapter is only the beginning all over again. There are always new techniques to learn, old techniques to sharpen, and beer culture to appreciate. I hope those of you that want to brew talk to local brewers and ask for help, ask to assist, ask to clean… just get your foot in the door and show them you are worth it! Thank you for reading my journey from Homebrewer to Head Brewer. Feel free to contact me with questions via email at kimcollins.brewerATgmail.com. Come by the brewery and see me sometime!